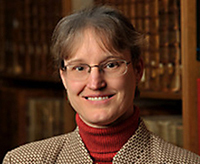 A member of the Notre Dame faculty since 1995, Constable had directed the Medieval Institute since 2009. Constable graduated from Yale in 1983 and earned her doctoral degree in history in Near Eastern studies from Princeton in 1989. She taught history at Columbia University for six years before coming to Notre Dame. Constable’s teaching and scholarship concerned interactions between medieval Christians, Muslims and Jews; the Mediterranean world; economic and social history; the history of medieval cities and urban life; medieval Spain; and perceptions of the middle ages in modern novels and film. A member of the Institute for Advanced Study in Princeton, Constable was the recipient of fellowships from the National Endowment for the Humanities, the American Council of Learned Societies, and the John Simon Guggenheim Memorial Foundation. She also was named a fellow of the Medieval Academy of America in 2009. Constable was the author of Trade and Traders in Muslim Spain: The Commercial Realignment of the Iberian Peninsula 900-1500, Medieval Iberia: Readings from Christian, Muslim, and Jewish Sources and Housing the Stranger in the Mediterranean World: Lodging, Trade, and Travel in Late Antiquity and the Middle Ages. She also was at work on a book examining Christian perceptions of Muslim identity in late medieval and early modern Spain. She is survived by her husband, Matthew Bell, and their sons, Owen and Sam. Funeral services will be private and a public memorial service will be announced soon. Originally published by Michael O. Garvey at news.nd.edu on April 17, 2014.